In my role as an adjunct faculty and program directors at a number of educational institutions, I interact with many millennials. I also have children who are millennials. Through these interactions, I have noted some interesting attributes about millennials. However, this article addresses millennials’ characteristics from a different vantage point. In the context of education, it can bring a lot of benefits to understand millennials and leverage their traits. This also serves as a means to connect with them, engage them and facilitate their discoveries about conducting a safe and secure online presence. Three characteristics are particularly worth sharing as they have implications for educators. They are highlighted here with the main aim of identifying appropriate approaches for engaging millennials in the education context. This article focuses on millennials as multitaskers, the selfie generation, and instant validation seekers. Without over generalising a whole generation, millennials do appear to be obsessed with uploading, editing and communicating activities on their hand held devices. They do all these different tasks briskly. They are obviously multitasking pros; so it seems. Multitasking actually has its advantages and disadvantages. There are benefits for certain tasks. The ability to switch between different projects can also stimulate creativity, keep boredom at bay, or even be a source of inspiration. It can be an asset and a liability. They are switching between tasks and not giving fullest attention on a specific task. Millennials multitask best on social media where they can fully exercise their netizenship. The multitasking skills seem to be confined to digital platforms. They don’t necessarily multitask well with other tasks such as handling multiple projects. The expeditious manner with which they multitask often compromises the quality of the output. On social media, for instance, the language use is simplified and casual with often very little attention given to accuracy. Teaching approaches that infuse social media can excite and engage millennials. It is already a common practice amongst many progressive educators to post assignments on social media. This is a often a good basic start. During the recent Malaysian election pre polling day, my 23 year old son gathered on Twitter over one hundred responses in less than 20 minutes to his quick pulse survey on whether netizens would go out to cast their votes. Sharing and gathering their views and administering a quick survey on related topics using Twitter are two simple yet exciting tasks that can be performed on social media. Other examples are infusing an app to uplift a certain classroom activity as opposed to sticking to mundane lectures. Motrain and 75 Tools For Creative Thinking are examples of apps that can be applied to a variety of topics. The more significant consideration for educators is to use this platform to raise students’ consciousness of language accuracy. This will ready them for a more formal environment of work where they are expected to use formal and accurate language. Social media is an excellent platform to monitor and track multiple project status. Since millennials are always present online, they will not miss out the reminders and status updates for their multiple projects that are put up online. Their constant quest to take photos of themselves has granted millennials the label, the selfie generation. Their selfies are lamented, among others, as symptoms of narcissism, self empowerment, self esteem and building an online presence. CBS News makes interesting suggestions on digital profile. These suggestions can be shared with students to shape their thoughts on the importance of initiating and maintaining a positive online presence. Those high quality selfies can be collated to narrate different periods of development such as important events during school years, higher education, internship, volunteerism and others. Educators can turn millennials’ incessant online presence into a digital profile project which helps students to initiate their online profiles. The profile will be a dynamic one that grows as the students progress in their education and graduate into the employment market. A local MARA residential school in Taiping, Perak has already initiated this for their 11th graders entry into higher education institutions. As part of the coursework activities, educators can encourage students to take photos as a visual record of their activities which are shared on social media. The whole class can access this database as evidence to be incorporated in their projects. Millennials might very well be the Like Button Society. They crave for instant verdicts for every post. The number of views, likes, and comments under two seconds is crucial. Millennials need to feel like what they are doing is important and that they are on the right track. Equally significant is the ever growing number of followers. So millennials are motivated by the number of likes, comments and followers. It’s their lifeline supplying oxygen to sustain their existence in cyberspace! To connect and engage students, educators can infuse the sense of satisfaction in the learning process the Like Button Society way. Millennials expect to hear their importance in a role and want to be acknowledged instantly and the acknowledgement must be made publicly preferably online. One technique is by gamifying the online project status updates through the milestone rewards with badges incentives and recognition programs. Validation, with likes and comments from team-mates and others outside the team, adds another level to the recognition scheme. I close with some cautionary notes. Something more interesting will eventually come along and that there will be shift in how millennials will conduct themselves online. What makes educators relevant today may make them dated tomorrow. Always be prepared for that shift. 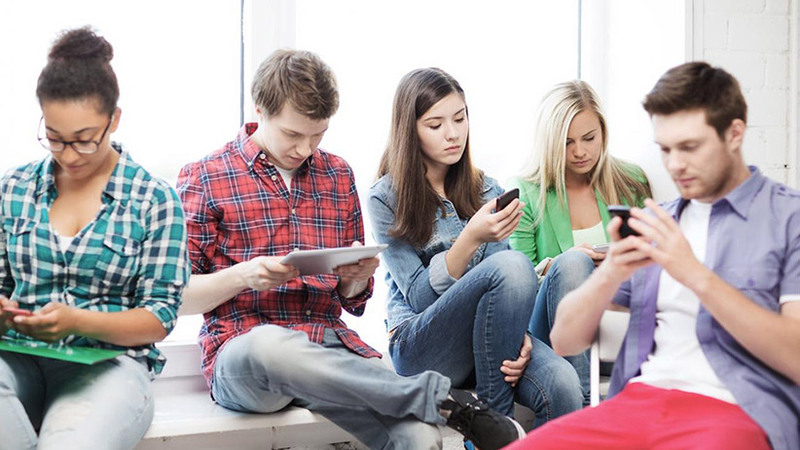 Get constant insights on how digital natives are communicating online. Watch out for the Gen Zers!